"Highly entertaining and extremely informative"
"Enthralled both pupils and staff with his extensive knowledge of medieval medicine "
Click here for the list of educational presentations and displays available. 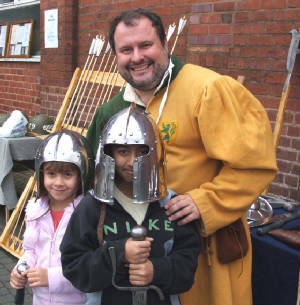 As an experienced reenactor and historical interpreter I can bring the past to life in your school or college, in line with Key Stages 1, 2 and 3 of the History National Curriculum, for students of all ages. Presentations are tailored especially for schools to tie in with the national curriculum; enrichment days or just for fun. Presentations can also be tailored to your own requirements. The emphasis is upon interaction and fun with students actively encouraged to participate. Each presentation comes with a teachers pack containing background to the presentation and individual and group student activities. The cost is £80 for half a school day or £150 for a full school day, (excluding expenses). It is preferable if class sizes are no larger than approximately 30 students. All presentations are suitable for home schooled groups.